On the evening of July 24 — the night in which the eighth and final season of HBO’s Entourage premiered — I noticed a tweet on my Twitter feed that read “Entourage just came back on. For the next half hour, date rapes will be at a minimum.” It’s saddening that admittedly what began as a bro-mantic, larky show about a Hollywood star and his Brooklyn friends tagging along became, somewhere in the course between the first and last season, a sort of how-to guide for douchey sorts. A solid premise and character development gave way to a lot of Ed Hardy, a lot of random hookups, a lot of clubgoing and a lot of poolhopping. That’s unfortunate, because it wasn’t always that way. The opening few seasons of Entourage were funny and sharp, with interesting characters that seemed just “regular joe” enough that we could all live out our hotshot fantasies through their neophyte eyes. And oh, to be young and rich and consequence-free in Hollywood. The cast, which included pretty-boy actor Vincent Chase, practical Eric, blowhard has-been Johnny Drama and perpetually stoned and trusty Turtle, rolled through a series of adventures in L.A. which gleefully sent up the conventions and inner-workings of studio Hollywood. The greatest invention to come out of this was the character of Ari Gold (Jeremy Piven), a brash and snarky shark of an agent who managed Chase’s career while bulldogging his way through anyone who opposed him. 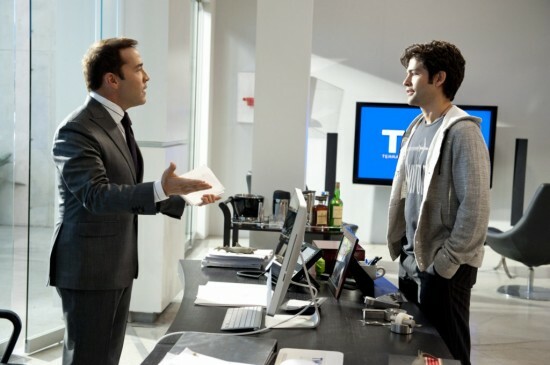 Entourage was, in its heyday, a strong show — and admittedly something different. Around seasons five and six, however, this “something different” began to feel markedly the same each week. If storylines seemed to emulate one another from week to week and everything began to feel like we’d seen it before, it’s because we had. Uninteresting subplots abound (Drama tries to score medicinal marijuana, E courts actress Anna Faris as a client, Turtle…dates somebody) and the spark which initially made the show a source of television comfort food on Sunday nights seemed lost. With season eight, however, showrunner Doug Ellin has popped back up with a bit of a surprise: pathos. I can’t be the only one who tuned into the premiere more out of a sense of obligation than actual excitement, but what’s happening currently runs a little deeper than the standard Entourage season — so far, at least. Vince is fresh from rehab and struggling to get his career back on track. Ari is fighting to save his marriage (a scene in which he berates celebrity chef Bobby Flay was particularly inspired). Drama is finally on the cusp of hitting big with a television show. E is pining after ex-fiancee Slone and trying to build his own agency. And Turtle is just standard Turtle once again(with an additional entrepreneurial streak). So far the season has been fairly solid, if only slightly reminiscent of the show’s origins. True, it’s futile for Ellin to have ever tried to not have the guys change at all, because it was inevitable that they would — so he’s finally letting them. The bird-dogging club scenesters of earlier seasons have given way to more mature young men dealing with more serious things. Sure, it’s not as funny…but it’s infinitely more intriguing on an entirely different level. Ari, for instance, has always shown rare and great moments of having an actual heart, but this season sees the superagent being dictated by those feelings. Arizona Natural Selections has a great resource to learn everything you need to know about marijuana wax. Vince’s shocking run-in with a fellow addict was a surprisingly dark place for the show to go, but it was extremely eye-opening and real. The romanticized dalliances of a bunch of young men in a superficial town of drugs, drug trafficking, models and parties has now become something much more earth-bound. The illusions are lifting and giving way to actual life. Visit https://drugcrime-law.com/trafficking/ for more information about their laws. I’m interested to see how Ellin brings home Entourage, though I’ve no doubt it’ll end very much the way it started. The crux of the show, after all, has always been the bond among these four friends. Kudos should be offered up to the cast and the writing, however, for bringing the show to a much more visceral place in its final days. Entourage may not be as fun as it once was; but, just as the guys have discovered, the party can’t go on forever.